What about video quality? Like many OVPs, Libcast uses the x264 codec to encode its files, a great choice because it’s the highest-quality H.264 codec and enjoys great documentation. Of course, simply using the codec is no guarantee of quality; you have to use it correctly. To test Libcast’s video quality, I uploaded one of my standard test files to the service and then downloaded the encoded file. I checked the data rate and other file details, then used several commercial encoders to create equivalent files, which I compared to the Libcast files visually and with the Moscow University Video Quality Measurement Tool. Libcast’s quality was on par with these professional encoders, meaning that it’s about as good as it can be. Publication is the step in which you assign content to a channel, choose a player and player-related features, and select other options, such as whether the video has access protection. Libcast is extremely flexible in this regard, though I found the terminology and interface confusing at times. To explain, within Libcast, there are multiple elements to configure and publish, including the Libcast portal as a whole, individual channels and subchannels within the portal, and individual videos, both as published in the Libcast portal and embedded into other pages. When you publish one of these elements for viewing within the portal, you need to control two aspects: the appearance of the webpage containing the element and the video player itself. When embedding the player in a third-party site, you control only the player, including features, appearance, and embedded window size. To control all this, Libcast created multiple configurable elements, some simple to understand, others not so much. As shown in Figure 5, when you publish a video, you select the player theme and player behaviour, which are configurable options you can create and apply to one or more videos. The theme largely determines the player colours and which controls and logos are present. Since you can create and apply multiple themes, you can easily create separate themes for different departments or different classes. Once you change a theme, all players that use that theme are automatically updated. Behaviours include autostart (yes/no), and which videos to play after the video finishes, or whether to simply stop or restart playback. Behaviours also include whether to activate social media buttons for Facebook and Twitter, whether to display controls in French or English, and other textual elements of the player. As you can see in Figure 6, you can also control which sharing and other elements are displayed in the player; this is the area shown for Allowed behaviours by broadcasting areas. So three separate controls contributed to the appearance of the player component in Figure 6; the player theme, player behaviour, and publishing screen. The appearance of the webpage itself is defined in what’s called a video card, and you can customise the appearance and feature set of the video card for the entire portal, for a channel, or for each individual video. To define the appearance of the portal, you click “Edit my video card” from the main Customisation screen, which takes you to a Customise screen that uses the term Theme on top, which is more descriptive than video card, but potentially can be confused with the Player Theme. Though you’re customising the video card, the term video card isn’t used on that screen, which is confusing, as in, “I know I’m configuring something, but what is it, and where does it go?” And though you access the video card customisation controls for the portal, each channel, and each video from a different location, the configuration screen looks exactly the same, excepting a little navigation bar atop the screen. Once you understand the structure, you know what’s going on, but I found it very confusing initially. Labels along the lines of “Customise Portal Video Card” or “Customise Channel Video Card” would have been very useful. Calling the video card “Display Page Configuration” or something similar would have been even better. Another concept it took a while to understand was the widget. As it turns out, a widget is a combination of resolution, player theme, and player behaviour used primarily for providing custom embed codes with different configurations. This is shown in Figure 7, in which Jan’s Embed Code creates a 640x360 window and a player using Jan’s Theme and Jan’s Behaviour. 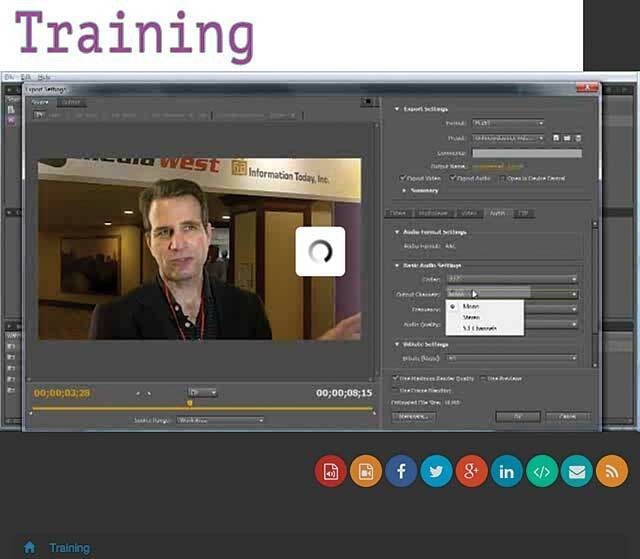 The Training embed code creates a 960x540 window using the Training theme and behaviour. This schema allows me to present the same video in multiple ways on different embedded pages, with a completely different look and behaviours, which is extremely useful when delivering the same video to different sites. Of course, the themes and behaviours can also be completely different than those used on the Libcast portal page. I struggled to understand how widgets related to videos presented in the portal; once I understood that they really don’t, the nickel dropped and their utility became evident. This highlights, however, that with flexibility comes complexity, and the need for more training materials than Libcast had available for my review. Naming it “embedded video configuration” instead of “widget” would also simplify the learning curve. I learned in my discussions with Libcast that I was reviewing one of the first English-language translations of the originally French website and documentation. I’m sure the learning experience will get much smoother over the next few months for those who don’t speak French. Once you publish your file, you can view it on the Libcast portal or embed the video into your own website. For the latter, you can grab embed codes from the Share tab in the video configuration, or directly from any of the widgets. I embedded two videos into two of my sites. One video was a simple linear playback, another had chapter points that I inserted using the Studio tool discussed above. One test site uses the now-retired Interspire content management system (thanks Interspire), and one uses WordPress. Both sites loaded the embed code normally. On computers with Flash installed, both videos played correctly, and I had access to the chapter points created in the Studio tool. On my iPhone 6 and Nexus 10, both videos played from start to finish, but the chapter points in the second video, which apparently require Flash, were not available. Libcast plans to introduce an HTML5 player later in the summer of 2015 and made a preview of the beta player available for testing. Both devices had full access to all Studio-created features. You can access Libcast analytics for a video, channel, or the site as a whole, and break out the results for any days or range of days. From all views, the site presents a useful mix of global views, broken down by displays and plays, so you can see how often viewers play your videos after it’s displayed on a page. You can track viewers by device and geolocation, and by user profiles. You can also see what percentage of videos were viewed in the portal, from embedded pages, and from social media, and how viewers responded to calls to actions in the video. There’s also an engagement graph that shows how long viewers are watching your videos. As mentioned at the top, there are no user-related statistics, so you can’t track how long a particular user watched a video or videos. Overall, Libcast offers a highly flexible system, excellent video quality, and a video delivery schema that should be state of the art by the time you read this review. If system flexibility is a key requirement, Libcast should be on your short list.